NEW YORK (CNN) -- David Letterman told his audience Thursday that he is the victim of an alleged extortion attempt and admitted to having sexual relations with several members of his staff, according to a press release from his production company. David Letterman admitted to having sexual relationships with female staff members, his company says. Letterman made the announcement during taping of the "Late Show." "This morning, I did something I've never done in my life," Letterman told his audience, according to a release from Worldwide Pants Inc. "I had to go downtown and testify before a grand jury." The 62-year-old funnyman said he received a package three weeks ago from a person who claimed to have information about Letterman's sexual dalliances, ultimately demanding $2 million to prevent public revelation. Letterman said he went to the Manhattan District Attorney's office, which conducted an investigation, and an arrest was made earlier Thursday. In his grand jury testimony, Letterman said, he revealed the relations with members of his staff. "My response to that is, yes I have," he said. "Would it be embarrassing if it were made public? Perhaps it would. I feel like I need to protect these people -- I need to certainly protect my family." It is not known when the sexual encounters with staffers took place. Letterman married long-time partner Regina Lasko in March. The couple, who have been together since 1986, have a son, Harry, 6. 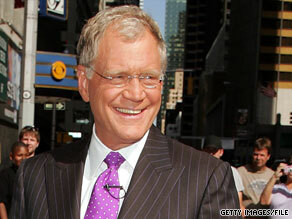 Letterman has been host of "Late Show with David Letterman" on CBS since 1993 after leaving NBC, where he was host of "Late Night with David Letterman" for 11 years. "Late Show" airs at 11:30 p.m. "Late Night" aired an hour later.